Do you need a ladder that can reach high places? Do you need a ladder that can be easily retracted or extended? If so, read on for a detailed overview of the 5 best telescoping ladders in the market. Introduction: Do you have the kind of job that often requires you to reach out to high places? Perhaps you’re a painter and you have to reach out and paint the ceilings. Maybe you drive an RV and often need to get to the roof. In all of these cases, you need a telescoping ladder to do the job. You might be thinking, “won’t a regular ladder do the job?” Sometimes, yes, a regular ladder would suffice. However, a telescoping ladder has a lot of added benefits that make them applicable to a wider range of situations. A regular step ladder is effective in painting ceilings and reaching out for high shelves, but it doesn’t have a lot of additional utility. Due to a single section, they can’t be extended or retracted, making them difficult to store and limited in use. A telescoping ladder, in comparison, has at least two to three different sections that overlap. As such, you can deploy them when necessary, or retract them when you want to store them. There are a lot of great telescoping ladders out there. However, there are also a lot of poor quality telescoping ladders. As such, you need to know how to tell a good one from a bad one. Selecting a poor-quality telescoping ladder can also prove fatal because it might suddenly retract while you’re climbing and you could fall. To help you out with your selection, we’ve personally vetted and used dozens of the best telescoping ladders in the market. Based on all of our research, we’ve compiled this list of the 5 best telescoping ladders out there. Telesteps 1600Ep is one of the finest telescoping ladders in the market. It was developed by a company that set the benchmark and standard for all telescoping ladders to follow. The Telesteps 1600Ep has been designed with a powerful but lightweight aluminum that helps keep the weight of the product low while still enhancing its weight capacity. Even though it just weighs 20 pounds, it has a Type 1A rating of 300 pounds. As such, it can hold up fairly heavy individuals along with their utility boxes. When expanded all the way through, it has a maximum height of 12.5 feet with a reaching range of 16 feet. However, it can also be retracted to just about 30 inches. The short retracted size, along with the low weight, renders it highly portable. The rungs of the ladder are just 3.5 inches wide and the ladder provides a lot of stability for the climbers. In terms of safety, this Telesteps telescoping ladder is both OSHA and ANSI verified. These are the Occupational Safety and Health Association and American National Standard Institute, and they are responsible for determining whether a product is safe for use. The bottom of the ladder is made of soft silicone so it won’t scratch the flooring even without rubber soles. Weight rating of 300 pounds. Weighs just below 20 pounds. One-Touch mechanism for easy retracting. Silicone feet and non-slip rungs. It’s undoubtedly the best telescoping ladder in the market. Has OSHA and ANSI rating. The OneTouch release feature ensures that it can easily be expanded or retracted. Silicone feet prevents marks on the floor. Lightweight and has a strong weight rating. This is the most expensive telescoping ladder in the market. 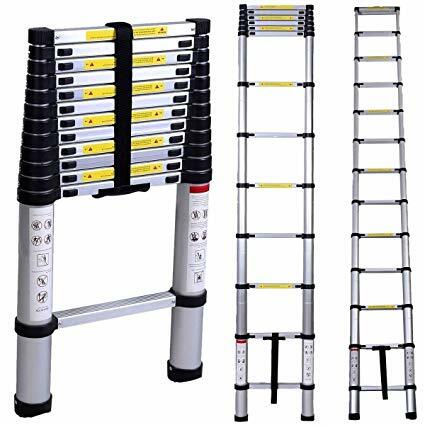 This is the most advanced, efficient, and safe telescoping ladder in the market. In fact, it has established the benchmark that all other telescoping ladders must aspire to. However, the high price makes it suitable only for professionals. The Xtend & Climb 785P is one of the most superior and reliable telescoping ladders in the market because it has been developed by Xtend, one of the premium brands when it comes to ladders. It comes in several different sizes. The shortest expandable size is the 8.5 feet ladder, and it extends all the way to 15.5 feet. it also comes in several different color options such as Blue, Gray/Yellow, Red, Black, and Green. This telescoping ladder is supported by an extremely strong framework and it has a powerful middle frame as well. The middle frame is added to enhance the stability of the ladder so that even sudden movements won’t make it skid. It comes with a no-pinch closure system that ensures that it locks in place and prevents destabilization of any kind. It’s ANSI/OSHA compliant so you don’t have to worry about the safety at all. The Xtend & Climb 785P comes with a carry bag so that you can easily carry it around. However, at 36 pounds, it’s not as light as some of the other ladders in this list. Height of up to 15.5 feet. Available in several colors — Blue, Gray/Yellow, Red, Black, and Green. Non-skid foot and no-slip rungs. Comes with a bag for easy portability. Has enhanced safety features like the One-Touch mechanism and no-pinch closure system. Retracts to 36.5 inches, which is still quite long. The Xtend & Climb 785P is yet another one of the most advanced telescoping ladders in the market. It has all of the great safety features and reach of the Telesteps 1600Ep. However, it’s not as lightweight, which is why it places in the second position. The Yesker Telescoping Ladder is one of the most flexible telescoping ladders in the market with a wide range of adjustability. At its most retracted state, it’s just 30 inches and thus can be stored in small spaces. However it expands by 1-foot increments till it’s at its peak at 12.5 feet. It’s not as long as some of the other telescoping ladders, but it’s affordable and great for home use. Every rung on the ladder has a spring-loaded locking mechanism which makes it easy to expand and retract this ladder. It weighs just 26 pounds and thus can be easily carried around, enhancing its portability. 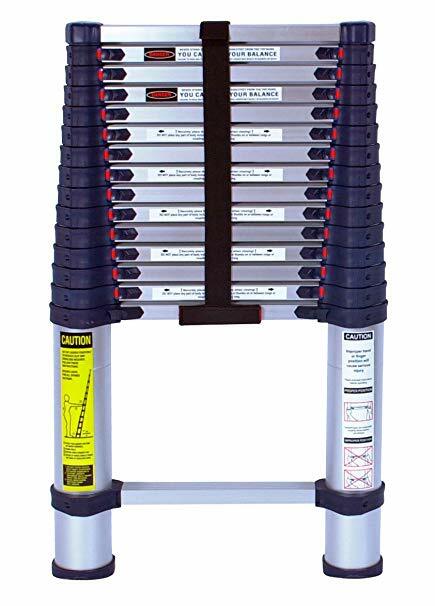 As a Type 1 certified ladder, it has a weight capacity of 300 pounds and can thus accommodate a fairly heavy individual. Minimum height of 30 inches. Maximum reach of 12.5 feet. Highly portable when it’s retracted to its lowest height. It’s not one of the longest telescopic ladders out there. The Yesker Telescoping Ladder is one of the most flexible telescopic ladders meant for home use. However, it doesn’t have a very high reach so you can’t use it to reach roofs of houses. The Werner Mt-22 is one of the tallest telescopic ladders in the market. At a height of 22 feet, it can easily reach the highest of ceilings, roofs, and any other place you want. In addition to the height, one of the best aspects of this telescope ladder is that it has 28 different height adjustments so you can use it for any project you need. It can also be extended outwards and converted into a 2-person ladder so individuals may climb from either side of the ladder. Furthermore, it supports 300 pounds of weight on either side of the ladder. These ladders are also incredibly durable and versatile. They use double-riveted rungs that provide stability on a long-term basis. The bottom of the ladder is wide-flared so that there’s no possibility of it skidding on the ground or causing an accident. The rungs are also non-marring equipped so that people can’t slip on them, and the side rails are curved for comfort. One of the biggest drawbacks of this ladder is that it’s pretty heavy and weighs 45 pounds. Furthermore, it doesn’t retract to a small size nor does it comes with a carrying bag. As such, carrying it around would either require a lot of strength or the efforts of two individuals. Accommodates up to 300 pounds on both sides. Can be used as a twin ladder. Extension height of 11 to 19 feet. Step height of 5 to 9 feet. Can be used by two people. The Werner MT-22 is one of the highest and most flexible telescoping ladders out there. 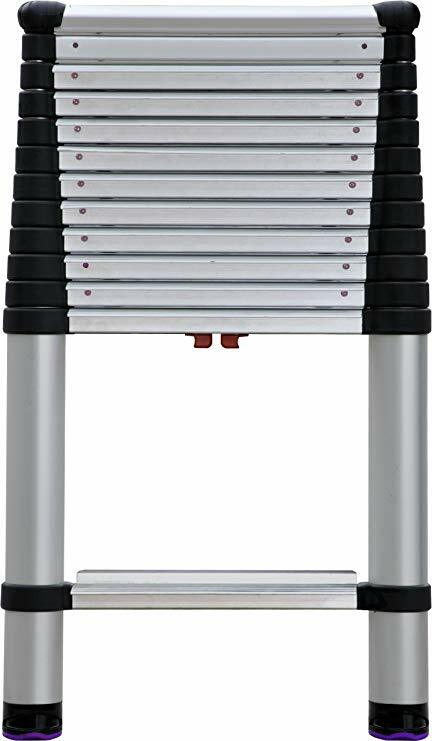 However, portability and lightness of weight are two of the most important aspects of a telescoping ladder and this ladder is weak on both those counts. It might be great for use outdoors or in homes with extremely high ceilings, but it’s not suitable for most homes. The Aluminum Telescoping Extension Ladder is one of the most stable heavy-duty telescoping ladders with a range of 2.8 feet to 12.5 feet, with 13 steps in between. It comes with a Nylon lock on every rung along the way so its extremely stable and you can rest assured that it won’t suddenly retract when you’re climbing up. In terms of height, it’s not extremely tall at 12.5 feet. Nor is it very short when retracted. As such, height range is definitely an issue for this ladder. Having said that, it weighs just 22 pounds and it can accommodate individuals up to 350 pounds in weight, which gives it the highest weight capacity amongst all the other ladders. In terms of aesthetics, it’s one of the most attractive ladders out there, incorporating a wide range of colors. It also comes with a fashionable carry bag that enhances its portability. Height range of 2.8 feet to 12.5 feet. 13 steps included in the ladder. Not a wide height adjustment range. The Aluminum Telescoping Extension Ladder is extremely safe and stable. However, when it comes to utility, it’s quite weak. It has a low adjustment range. It’s neither one of the tallest ladders when extended, nor is it particularly small when retracted. It’s ideal for home use but not much else. A telescoping ladder is the most compact and portable form of the ladder out there. In this part of the article, we’ll give you an overview of telescoping ladders, what they are used for, the features to consider when buying them, etc. What do you use a Telescoping Ladder for? A telescoping ladder can be used for a number of different purposes. Painters need to be able to move in and out of the house and paint over really high places like ceilings, chimneys, roofs, etc. As such, you can use a telescoping ladder to be able to move through various rooms easily. You can contract it when you’re indoors and expand it when you need to reach high places like roofs. Furthermore, they are usually powerful enough to hold you and your utility box as well. In order to reach the attic, most people use a pull-out step-ladder. However, these are pretty inconvenient, difficult to climb, and they lead to accidents frequently. In this case, you can instead install a telescoping ladder so that you can access the attic whenever you want. In fact, even your kids can access the attic and you don’t have to worry about them falling off. If the aesthetics are important to you, there are a lot of creatively designed telescoping ladders out there as well. RVs come with their own fixed ladders. However, they are usually connected to the back and only give you access from one point. If you have a telescoping ladder, you can easily carry it around in your RV by contracting it, and then expand it and use it to climb the roof from any angle. Telescoping ladders make for great products to be used in swimming pools or in boat docks. You can easily find telescoping ladders with non-skid rungs that allow you to descend into a pool or climb a boat. When you’re not using them, you can retract the rungs and store it away. However, when you get a telescoping ladder for this purpose, get one with handrails for support. 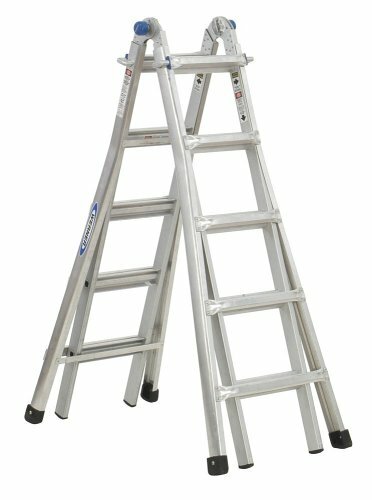 How to Select a Good Telescoping Ladder? There are a lot of different factors that go into deciding which telescoping ladder is ideal for you. In this part of the article, we’ll figure that out. Safety is one of the most important factors to consider when you’re buying a telescoping ladder. Studies show that over a million accidents happen every year as a result of falling from ladders. You should make sure that your ladder comes with a rubber grip so that it doesn’t skid or move on the floor. The rubber grip will also prevent the steel ladder from leaving marks on the floors, especially if they’re hardwood. The rungs of the ladder should also be made of non-slip materials so that you don’t slip off, especially if you’re using it in a water-based setting. And the aluminum tubing should be thick and dense so that it doesn’t shake when you’re climbing it. The telescoping ladder should also have a stabilizer bar between the legs so that they don’t contract or move inwards when you’re climbing. Furthermore, all telescoping ladders must be OSHA/ANSI verified so you know they’ve passed the safety standards. The greatest advantage of using a telescoping ladder is that they can be expanded and retracted. As such, you should get a multi-height adjustment ladder. This will ensure that you can expand the ladder to various different heights for different purposes. It will also help you store the ladder in smaller spaces. In addition to the retractability, which will ensure that the telescoping ladder can be carried around and stored in small spaces, you should also ensure that your ladder comes with a carry bag. A carry bag with straps will help you strap it on your shoulders and carry it around without difficulty. Before you get any telescoping ladder, you have to consider what your primary goal is. If you need to use it as a pool ladder, a smaller ladder would suffice. However, if you need to use it for painting roofs, then you’ll need a long telescoping ladder with multiple rung adjustment capabilities. Choose your ladder according to your specific needs. Ladders can be very dangerous if you’re not careful about how you use them. Please be sure to keep the following tips in mind whenever you’re using a telescoping ladder. Purchase a ladder that’s OSHA/ANSI verified. Check the weight capacity of the ladder. It should be a lot higher than your body weight. The ladder must be high enough to reach any spot you want. There should be no cracks or signs of corrosion on the ladder. The non-slip rubber grips should be firmly placed. It should always be supported on a stable and even structure. The angle must always be balanced at approximately a 75-degree angle or lower. If it’s too vertical, there’s a strong chance of it tipping over. For every four feet of a ladder’s height, the base must be at least one feet away from the wall. You must stand several rungs below the topmost one. You should always maintain at least three points of contact with the ladder — either one hand and both feet or both hands and one foot. Don’t carry a heavier load than you can manage. Making sudden moves on the ladder can destabilize it from the bottom, causing it to topple over. Don’t place your ladder at a point of high foot traffic as a passerby might kick it under you. If you’re using the ladder to climb very high, be sure to wear a safety harness that can arrest your fall about 6 feet off the ground. Don’t climb a wet ladder or when it’s raining. Don’t lean to the side when you’re climbing a ladder. Ideally, you should use the ladder when you have a partner standing underneath in case there’s an accident. I hope these reviews have proven helpful to you and that you now know which telescoping ladder is ideal for your specific needs. In addition to the reviews, you should also take into consideration all of the information provided in the Buyer’s Guide section. Instead of reaching out straight for the longest telescoping ladder, you need to also consider your specific needs and storage space. Some ladders are meant for the outdoors and some are meant for the indoors. Furthermore, as we’ve already mentioned there are a number of features to consider such as non-slip rungs, ease-of-assembly, etc. If you have any other concerns or questions about the best telescoping ladders, feel free to mention them down in the comments section.